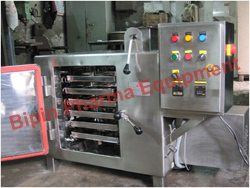 ï»¿ Tray Dryer, Tray Dryer Manufacturer, Tray Dryer Suppliers, Mumbai, India. Our tray dryers are designed by our professional designers and skilled personnel craft every machine with almost care and precision to deliver various models which are high performance and also low on maintenance. &ast; External walls are made out of 2mm thick SS 304/316 quality. Internal walls are built of 1.6mm thick SS 304/316 grade sheets which are lined by 50/75/100 mm thick glass wool insulation and cladded with SS polished sheets. &ast; The front door is equipped with an which is adjustable air outlet and a fresh air inlet lined by 15 micron pp cloth filters. &ast; The explosion proof door is securely locked with the help of ibolt system. &ast; The door lips are lined by silicone (Hollow) rubber gasket to make sure there are no leakages. &ast; The heaters that are fit on the sides on the fryer facilitate the uniform heating of the â€œuâ€� tubes SS 304 each of 1Kw which attain a maximum temperature of 100°C inside the dryer. &ast; A Digital Temperature Indicator offers full control over full range of heating load. &ast; The terminals of the heaters are placed outside the dryer to facilitate safer operations for solvent based products.